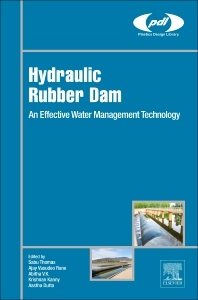 Hydraulic Rubber Dam: An Effective Water Management Technology is the go-to source for information on the materials, manufacture, mechanics and functional benefit of rubber dams in water management. Readers will find a detailed background on water conservation and coverage, how inflatable rubber dam technology contributes to the picture, and information on the proper manufacture and use of rubber dams to increase water storage for release and delivery during drought. In addition, the book presents tactics on the even distribution of water across populations, how to increase water use efficiency, conservation, and how to prevent flooding. In particular, this book details specialist manufacturing techniques, including the development of rubber compounds and fabric, the bonding and anchoring systems which hold the rubber dam to the underlying concrete structure, and inflation and deflation mechanisms for rubber dams. The book provides a holistic lifecycle assessment of rubber dams to give additional insight to readers looking to deploy rubber dam technology. Aastha Dutta (M.E Chemical) is working as an Assistant Professor in Maharashtra Institute of Technology, Aurangabad. She pursued ME (Chemical Engineering) from Jawahar Lal Nehru Engineering College, Aurangabad. She has teaching experience of 14 years and has been teaching subjects like Material Science, Organic Chemistry, Physical Chemistry of Polymer, Biopolymers, Polymer Recycling and Waste Management, Polymer Reaction Engineering.